Yoroi Toshikoshi started in the middle of Kamakura Period which is middle of 13th century by Yasuuji Ashikaga for making a strong relationship between Samurai. At the south gate of Banna Temple, Yasuuji Ashikaga brought all his Samurai and cried triumphantly, and this event becomes the legend of Ashikaga city. This event has been kept since then until stopped with the confusion of Meiji Restoration. In 1915, Ashikaga city brought back this traditional event, and now they still celebrate this unique way of Setsubun. Festival started at Orihime city hall. People wear their own Samurai Armors and assembled at the hall. Then, they march 1.3 km to Banna Temple with torch and traditional conch shell. Some people bring their family armors from their treasure, and some people made by themselves. 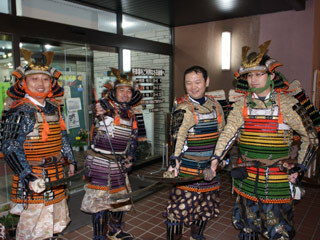 If you don't have Samurai Armor, Ashikaga city center will rent one for you. This festival is not only Ashikaga people, but opened for all other people. Some people join this festival from Osaka. About 200 people join this event every year. At Banna Temple, they throw soy bean like other Setsubun festival. In 2009, as special events, there is the demonstration of Samurai gun powder units. You could see the real Samurai gun shooting.